Building your dream home is an exciting time. But with all the excitement of home design comes a lot of paperwork and even more complicated information to try and comprehend. Floor plans are an important aspect of a new home design so it’s important that you not only understand them but also know how to use them to choose the perfect living spaces for your home. A house plan is a collection of drawings which define all of the construction specifications for your new home. They are essentially construction plans created by your architect and building contractor which are sometimes referred to as blueprints. An overhead view of the construction site and the home in reference to the boundaries or lot. An overhead view of the completed house, detailing room sizes, ceiling heights, all walls, doors, windows and any built-in elements like plumbing fixtures and cabinets. A non-perspective view of the home including front, rear and side elevations. This details footing dimensions and locations (which is what connects the home to the ground). This is a plan for your walls which will detail the type of timber used. A plan that details how the area will be constructed and details how all services will be arranged. This will detail the type of roof as well as the pitch (degree of the slope) and framing. This will show the locations of all outlets, TV sockets, switches, power points and fixtures. It will also detail where the electric lines will be run. This will highlight the placement of all the plumbing fixtures and piping. As you can see from the many different drawings that create a house plan, it should give you all the information you need about your house design. Your home builder and their expert contractors will likely know far more than you do about the technicalities but there are a number of things that you should look for in a plan to ensure that the house design meets your needs and expectations. Windows, walls and doors: Consider which set up will give you the most natural light. Power points: Think about what will be practical with your furniture and interior design. 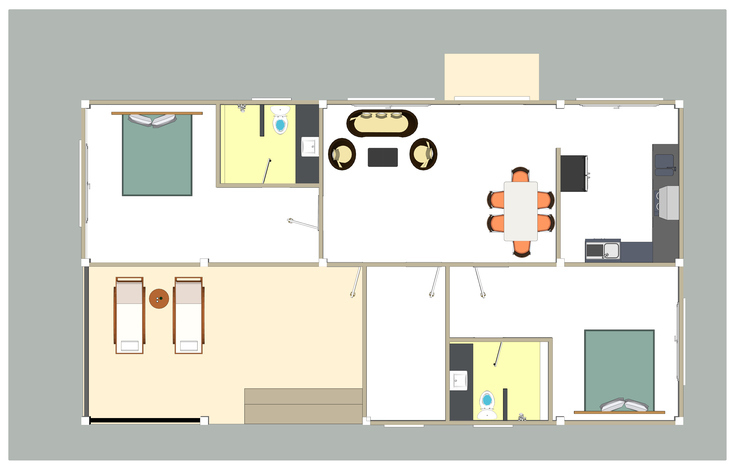 Layout: where should the bedrooms go in relation to the bathroom? Do you want an open plan living and kitchen area or separate rooms? Room sizes: If you have or are planning on having a family, remember to think long term! Once you know how, floor plans are fairly easy to read. The best way to wrap your head around a floor plan is by first familiarising yourself with all of the symbols and construction elements used. Drawings, design houses and furniture. Then, make sure you read the index at the beginning of the house plan as it will help you understand any abbreviations used throughout the document. If in doubt at any point, ask your builder or contractor what something means. They won’t expect you to be an expert in reading floor plans so don’t be afraid to raise any questions or concerns you have. After all, you will be the one living there in the long term so you have every right to understand what’s going on. If you’d like to build your own home, take a look at some of our lots for sale. And for further inspiration on how to bring your new home to live, why not visit our display village?